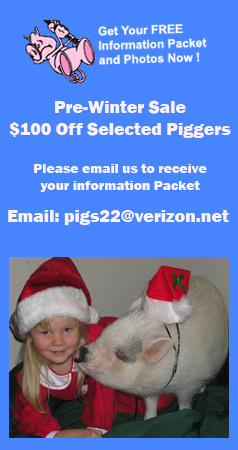 Your little pet pigger is $350.00 all colors for a pet to $850.00 up for a breeder (plus vet and shipping charges). You can use a credit card online through PayPal and you get to choose what color pigger you want out of the litter. I try to keep my pet prices affordable- the breeders cost the most. I have babies almost all year 'round but I usually have a WAITING list for my little sweeties. If you would like to get on the waiting list, simply make a $200.00 deposit for pet or $400.00 deposit on Breeders.